- Publisher "Whatever is true, noble, right, pure, lovely, and admirable-think about such things. "Think about it. If we are to take seriously this biblical principle, it would change our lives. 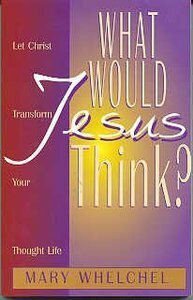 What Would Jesus Think?, written in a practical, easy-to-understand style, shows us how to "take every thought captive to make it obedient to Christ" and, in turn, know real freedom in Christ. Mary Whelchel explains what biblical thinking is and, using real-life example, shows how to replace wrong thoughts with right thoughts. - Publisher This book will help Christians "take every thought captive to make it obedient to Christ" (2 Cor. 10:5) and know real freedom. About "What Would Jesus Think"
"Whatever is true, noble, right, pure, lovely, and admirable-think about such things. "Think about it. If we are to take seriously this biblical principle, it would change our lives. What Would Jesus Think?, written in a practical, easy-to-understand style, shows us how to "take every thought captive to make it obedient to Christ" and, in turn, know real freedom in Christ. Mary Whelchel explains what biblical thinking is and, using real-life example, shows how to replace wrong thoughts with right thoughts. This book will help Christians "take every thought captive to make it obedient to Christ" (2 Cor. 10:5) and know real freedom.